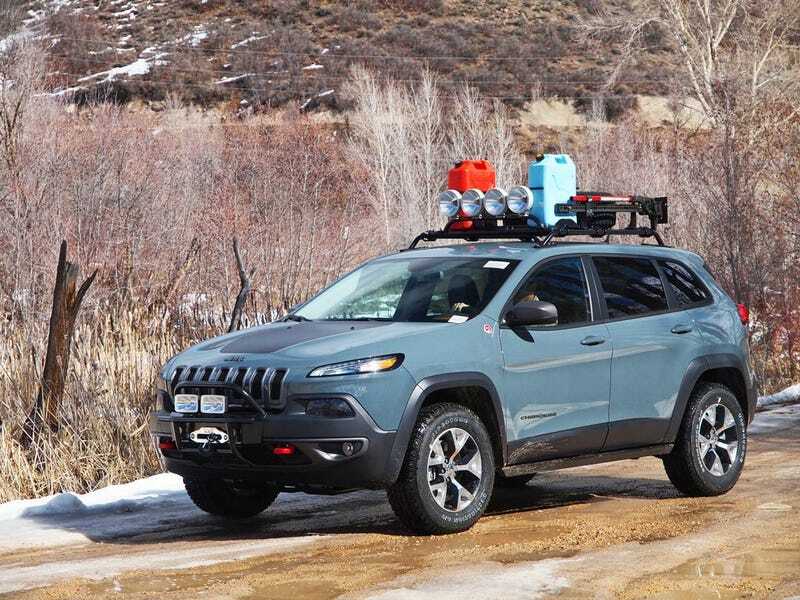 Andrew wrote a piece about rocky road off road's attempt to lift the Cherokee, unsuccessfully...or rather...that they found it impractical. I followed up with the company when I went to pick up some of my own parts when they showed me the work they had been doing on it. I just got a photo from their facebook page of the finished product. I love that rack. There is a 9000 lbs which in the bumper, a pusher bar, rock sliders that are so well integrated they look stock and the coolest rack ever. Seriously, it bolts to the roof in the existing racks location and has mounts for a hiLift, Shovel, Spar tire, lights, gas and water. To be honest, I think this would be a great adventure machine as it sits (though please....get the v6).